Old tractor shed was build of logs and corrugated iron. The logs rotted away and the shed was crumbling. The new structure is build of arcs constructed from free packaging timber. Covered in Heavy Duty tarp. Now, 6 months later, it stood 60km/h winds and never had leaves accumulated on the roof I think the shed shape is really good. Wow, that is inexpensive but not cheap. Do they sell these in USA? 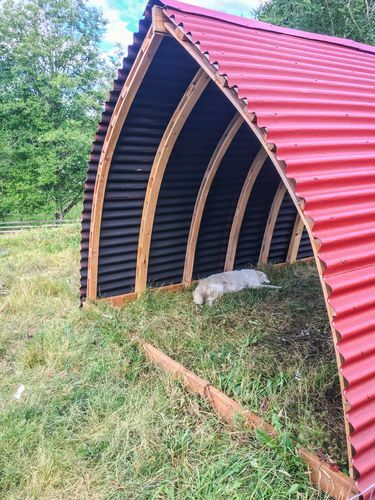 I used a similar bow roof concept for a goat shed last summer. I had a heck of a time keeping the curves consistent from one bow to the next. Yours looks perfect! Well done. Dave, you say on the cheap but I love the way it turned out. I like it better than a 30K build myself…but that’s just me. It has character and soul, something a square box never will. I’ve never seen this type before, but definitely something I want to integrate into my farmscape. I may be building one very similar soon. Yours flows so beautiful with the landscape and country life. If you don’t mind me asking, where do you live? It’s absolutely gorgeous there….you’re tucked away in the brush country. God it’s nice!! @mahdee, the cost include cement for the footings, and heavy duty tarp. For a shed this size its very cheap. @Geeph, Thanks for posting your build pic. I noticed yours have a ridge board. How did you put it in place? It seems you have much more arcs as well. What size is the space between them? Funny, I wanted to clad mine with corrugated iron from the old shed like you did. I believe it adds strength to the structure and could save the tarp cost ;) But when my wife saw the skeleton she wanted something translucent for cladding. We couldn’t decide so the tarp was a temporary solution. @Chris, Thanks mate. I live mid north coast of NSW. It is nice corner here. If you need some extra details on how to build just PM me. As I mentioned in the initial post one of the advantages of this kind of shed is that leafs don’t accumulate on the roof and side winds have less impact. @DaveGlx, I was able to place one end of the ridge board on a ladder and then stood up the first pair of arcs on the opposite end. I then temporarily braced those while going back to the ladder end and stood up that pair of arcs. The rest just went into place. I have 2 feet between the arcs. The siding is Ondura which I really like and had been wanting to use on a project. I could have probably gone wider on the arcs and could have certainly used cheaper siding, but I needed something pretty heavy duty to stand up to the goats. The siding definitely adds structural integrity. I have also since framed and closed the ends so it’s pretty darn sturdy. Real good looking shed, Dave!!! I like you construction method!! It looks like it could have a shelf or floor about 4 ft down from the top for storage, too !! @Geeph, I never heard about corrugated asphalt roofing before. Seems like interesting material. Does it have some sort of flex like corrugated iron? Also I read at your home page you build all sort of farm structures. It is interesting. Maybe you can post some examples. I used Corrugated Asphalt Roof Panels on a lean-to I built about 15 years ago but didn’t support them well enough. They became soft in the hot summer sun, sagged a little, filled up with water, sagged more until they failed. My fault but something to be aware of. Good looking tractor barn. interesting construction. Dave that corrugated asphalt roofing is something that just recently started showing up in big box stores on the east coast some 5-7 years ago. Not something that I would ever consider using on anything of any magnitude. They are inherently weak and don’t possess enough rigidity to them. I’ve used some of them on some small frame chicken coops but wouldn’t use them on a nice shop or anything that covers something precious below. You really aren’t missing too much by having not seen them. Very creative and interezsting approach. NICE! !